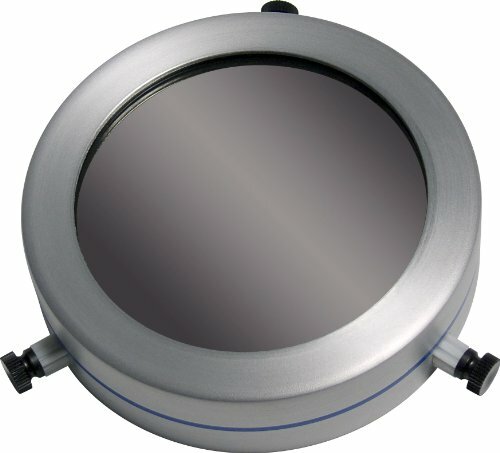 Designed to fit snugly over the aperture of your telescope, these optical glass filters block 99.999% of incoming sunlight, allowing you to safely observe sunspots and solar granulation in the Sun's photosphere. The Sun appears in a natural, whitish color. The glass elements are machine-polished and triple-coated with nickel-chromium stainless steel for a scratch-resistant surface. Each filter has three nylon thumbscrews to ensure a snug fit to the front of your telescope or binocular. The thumbscrews complement the press-fit foam lining inside the filter's durable aluminum cell to accommodate diameters up to 1/4" smaller than the nominal size. A tight press fit is still required for safe solar viewing. Lifetime limited warranty. CAUTION: Never look at the Sun, either directly or through a telescope, without a professionally made protective solar filter installed that completely covers the front of the instrument, or permanent eye damage could result. ZWO LRGB Filter Set 1.25"